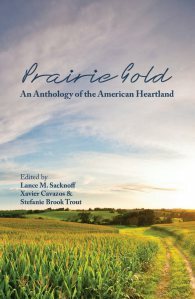 This month, Iowa publisher Ice Cube Press released Prairie Gold: An Anthology of the American Heartland, a collection of all new writing that explores and celebrates Midwestern culture and identity through fiction, nonfiction, and poetry. Edited by Lance M. Sacknoff, Xavier Cavazos, and Stefanie Brook Trout, the anthology includes 11 short stories, 13 essays, and 86 poems from 67 contributors, whose diverse perspectives speak to the complexity of the Midwestern experience. Trout’s contribution, “Letters After Achilles,” is an essay-in-letters about, among other things, the May 2 snowstorm of 2013, the Bluff Creek Bee Club’s first year, the Casey Land, and tallgrass prairie. “The Midwestern identity demands further characterization and recognition,” says managing editor Lance M. Sacknoff in his foreword to the collection.